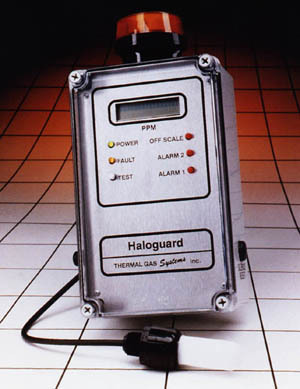 HALOGUARD ® is the cost effective, reliable way to reduce costly refrigerant leakage. With a HALOGUARD ® leak monitor installed, you quickly know where the leak is located and how much refrigerant you are losing. This exclusive early warning system detects leaks in a designated area and flashes a bright red LED when parts-per million (PPM) reaches the alarm level you preset. With a dialer or other remote signal hookup, maintenance personnel will know immediately when and where a leak occurs. Repairs can be made quickly, before you lose costly refrigerant or perishable products. An optional analog output is available to interface with EMS/BMS systems. Remote sensor with 6 ft. instrument cable and DIN plug, extendable to 300 ft.
Haloguard is unconditionally guaranteed for one year from the date of shipment. Any device found defective in that period will be replaced free of charge.